Whitehall Williamsburg Classic Address Plaques - - Estate size address plaque measures 20.5" x 12" x 1.25" and holds up to five (5) 5.5" characters. Choose wall mount style (Whitehall model 1294) or lawn style (Whitehall model 1296). Estate lawn marker comes with two lawn stakes. Whitehall plaques are crafted from rust-free recycled aluminum. Paints have been specially formulated and weather tested to withstand the harshest elements. Made for you in the USA. Please type the text you desire in the Text box above. Small images (from left to right): BG black surface with gold characters; BS black surface with silver characters; OB/ oil-rubbed bronze; OG bronze surface gold characters; and PS (pewter surface with silver characters). 5-year mfg. warranty. Made in USA. Please allow 2-3 weeks for delivery. NEW! 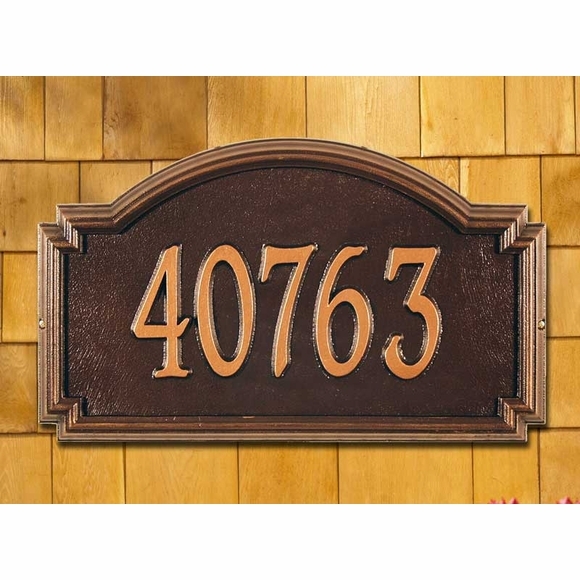 Preview it with your address in our Address Plaque Lab. Preview Wall Mount. Preview Lawn Mount.